This type of visa used to be very common when visiting Thailand until Thai immigration viewed that many had simply been abusing the visa and living and working in Thailand illegally. Obtaining this visa now has become very difficult in Asia and outside of Asia for this reason. These are the normal options. From time to time that Thai embassy will issue you a multiple entry marriage visa if you can prove that you have a Thai wife with a marriage certificate and you also need to show them at least 100,000 THB in a Thai bank account in your name. Each embassy has their own rules about this but this is the most used rule at the moment. It is still very difficult to obtain a multiple entry marriage visa in Asia though. This type of visa has 4 ‘legs’ on the visa and you need to leave Thailand every 3 months to activate the next ‘leg’ of the Thai visa. The business visa is normally issued as a single 3 month visa however if you can obtain a letter from a Thai company to underwrite you visa then they will normally issue you a multiple entry business visa. Much like the marriage visa you also need to leave Thailand every 3 months to activate the next part of the visa. Again – very difficult to obtain in Asia and also becoming difficult to obtain outside of Asia. If you are looking at visiting Thailand and need a multiple entry visa then speak to lawyer about your needs and how best to obtain the multiple entry visa in your country. 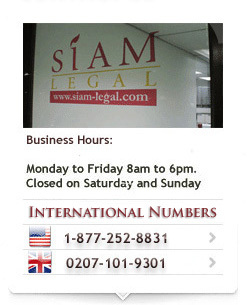 Call us today or speak to us online about your current visa status. Hi, I would like to get a multiple entry non immigrant visa but I’m not yet married to my girlfriend. Any advice would be greatly appreciated. There are several ways in which a foreigner may be able to obtain a multiple-entry non-immigrant visa. One is by securing a job at a Thai company. When you are legally employed in Thailand, you will be eligible to apply for a work visa as well as a work permit. Another option is the non-immigrant visa application based on retirement for foreigners who meet the age and financial requirements. Also, you might want to consider is enrolling in a Thai school. Foreigners who are taking a short course or study in many schools in Thailand are eligible to apply for an ED visa. To know more information about ED visa requirements and processing, we suggest that you directly contact your preferred Thai school. Been working legally in Thailand for about 5 years till presently, but my current Company/Employer is downsizing and in short my contract will expire by 12th August 2015. What are my options to stay longer here in Thailand? I have a Thai Partner (I say partner because i can’t marry her at the moment). So my main reasons for wanting to stay longer are to be with her as much as possible and find/look for another job here in Thailand. You may apply for a tourist visa at the Thai Embassy or Consulate in a neighboring countries such as Laos and Malaysia. However, you might need an assistance from an agency in Bangkok who offers such service. Another option that you might want to consider is enrolling in a Thai school. Foreigners who are taking a short course or study in many schools in Thailand are eligible to apply for an ED visa. To know more information about ED visa requirements and processing, we suggest that you directly contact your preferred Thai school. I am British and married to a Thai national with two children. I work 282 days out of Thailand and then spend about 25 days in the kingdom. Can I get a Thai marriage visa at immigration in Jomtien or someone said there is a new 5 year visa now which you can get without leaving Thailand? Can you please advise me on which visa is best for me? I really need at least a non immigrant O but I would prefer it if I didn’t need to leave Thailand. If your marriage with your Thai spouse is registered in Thailand, you may apply for a non-immigrant O visa based on marriage. With this type of visa, you will not be required to leave Thailand within the period of visa validity. This can also be renewed inside Thailand every year. If you wish to talk to one of our visa specialists for further advise, please leave you phone number and we will contact you. Hi, I am Russian, I have Cambodian buisness visa 6 month. My friends invited me in Thailand for 2 monthes. Is it possible to stay in Thailand by Cambodian visa, ore l should apply new visa in Thai embassy in Phnom Phen? You must apply for a Thai tourist visa if you wish to stay in Thailand for two months. A Cambodian visa is only good for entering Cambodia and is totally separate from Thai visas. I have been in Thailand since May 2015, originally entering the country on a multiple entry tourist visa issued in the UK. Once these had all been used, I crossed over to Laos and obtained an additional 60 day single entry tourist visa. This is due to expire on Dec 20th. I have never applied for a 30 day extension to any of the above visas, however as it is close to Xmas, I would line to, in this case, apply for one at the immigration office in Jomtien. Can this be done? I do have a Thai girlfriend, and we are currently planning our wedding for Feb 14th 2016. May I thank you for your time in reading and addressing my enquiry. Yes, you may visit the immigration office in Jomtien to apply for a 30-day extension to your visa. The fee for the extension is THB 1,900. I usually obtain a 90day visa from Thai Consulate in Hong Kong, as I am married for 6 years and work in Asia and stay in Thailand when I can. Papers submitted are copies of wife’s id and her passport and our address details in Thailand and my passport, photos and application. Does this paperwork change if I apply from Glasgow, UK? Yes, it will be the same set of documents. You need in Glasgow, you have a choice to get 90 days or 1 year non immigrant O visa for your wife as your dependant. I would like to ask I have a work permit but I didn’t show up in immigration on 90 days. I want to know is there a penalty or not it’s already 2 months but I didn’t know. What can I do? My visa expired on March 18, 2016. Thank you. Hoping for your quick response. The fine of overdue notification is 200 baht per day and is not exceeding 5,000 baht. You will need to visit the immigration office to settle the overdue fine. I have a Retiremnt O VISA for 12 month, multiple (M). Does it mean that if I will re-enter Thailand before 12 months expires, my VISA will be extended again for 12 months. E.G. : I have a VISA FROM 1 FEBRUARY 2015 TO 3 OF FEBRUARY 2016. HYPOTHETICALLY, I will re-enter Thailand , say, on 1 of January 2016. Does it mean my VISA will be automatically extended to 1 of January 2017? No, the extension is not issued automatically to visa holders. You will need to apply for the extension at the immigration office on or before the expiration of your current visa. Hello, I have a question. I am Italian and I will come to Thailand in May! I will come by boat from Langkawi (Malaysia) to Koh Lipe the 5th of May and I will leave Thailand the 12th June. How does it work with the visa? Italian passport holders are not required to apply for a visa if staying in Thailand for a maximum period of 30 days. Since you are entering Thailand by boat, make sure that you have your passport stamped at the nearest immigration checkpoint. I already extend my visa of 30 days but I need 19 days more. Any chance I can get another extension or should I go out the country? I work on cruise ship but I live in Thailand. I have a son but not married. I don’t have any visa tourist or Family! Any solution for this time or maybe should I make Family visa? No, you are only allowed to get a 30 days extension once. As an option, you may do border run to a neighboring country when your extension is over. Regarding your concern on applying for a Family Visa, it’s best to contact or visit the Immigration Office to get information about the requirements and process.